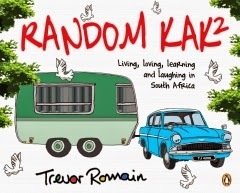 The hugely popular Trevor Romain is back with more random memories about growing up in South Africa in the 70s and 80s. In this follow-up to Random Kak I Remember about Growing Up in South Africa, he offers a humorous and unique take on some of the sights, sounds and experiences that have made living in this country so inspiring. Remembering what it means to be South African has never been as lekker as it is in this illustrated memoir of a colourful past. Mkay so Penguin kindly sent me a copy of this book. I think I may even have requested it to review ... it looked and sounded like the sort of books The Trucker seems to have a lot of, less like ones I'm more likely to pick for myself. It was rubbish. Okay, it wasn't completely devoid of entertainment. I think I read it in one sitting in an hour. The only bits I liked were the "South African words" cause they made me smile as I know and remember so many of them. The longer "stories" were completely arbitrary and I didn't find them amusing or entertaining at all. I thought it might've just been my sense of humour, but The Trucker wasn't impressed with this book either. When they named it "Random Kak", it wasn't an understatement. I reckon I'll prob give this to Daddio to read and perhaps he'll enjoy it ... but it's not something I'd go out an buy for anyone I know. Hey there - I am sorry you did not find my book appealing. I don't blame you. It's just a bunch of random kak from my old journals and diaries and is probably only appreciated by idiots like myself. (Lucky for me a few knuckleheads do enjoy this kind of kak and the first printing of book one sold out very quickly and this edition is doing really well too.) I thank you for your honesty though and the fact that you even looked at the book. I do appreciate and value all opinions as it helps me to be a better writer.